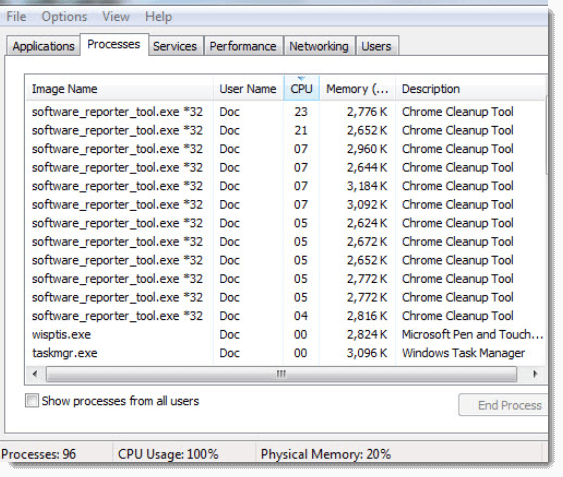 If you keep seeing unusual high CPU or Disk usage caused by a process called Software Reporter Tool (alongside with a description called Chrome Cleanup Tool) in your Windows 10 task manager, here’s how you can fix the problem. 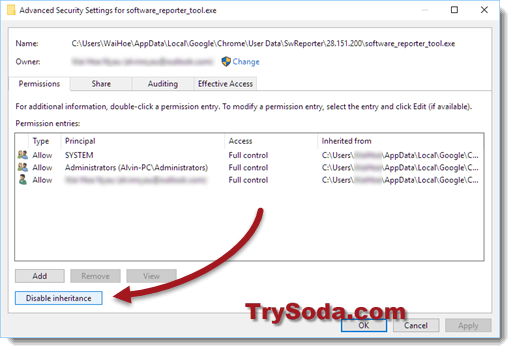 Software Reporter Tool is an executable process came originally with Google Chrome as a side process that scans your Windows 10 for possible applications that may interfere with how chrome works. When it finds anything that it thinks may cause issue to Chrome, it will suggest user to run Chrome Cleanup Tool. In fact, both Software Reporter Tool and Chrome Cleanup Tool are identical. They are the same and work as one. So, if you remove Software Reporter Tool, Chrome Cleanup Tool will be removed too. It usually scan your computer once a week. The tool itself brings no harm at all if there isn’t any issue between your software and Chrome. Even if it has, it will only notify you and ask for your permission to do some cleanup after the scan. However, in some occasions, it will have problem scanning in the background, and it keeps scanning without stopping. Thus, causing high CPU usage (sometimes constantly at 100% usage), high disk usage, or both in your system. If you see something like the screenshot shown above in your Windows Task Manager, it is the software reporter tool that are causing all the slow down and lags in your computer. It’s worth mentioning that the tool doesn’t have any network communication. All it does is scanning your local software, and report to Chrome. To disable the process, read – how to disable Software_Reporter_Tool.exe in Windows 10. You can remove software_reporter_tool.exe from Chrome without causing any issue to Chrome. It’s just that it will stop scanning and reporting problem to you when there is a crash while using Google Chrome later. You wouldn’t know what’s wrong unless you run the reporter tool again. Replace Username with your actual username in your Windows 10. Click on the folder that looks like a version number. Delete software_reporter_tool.exe from the folder. You may also delete the entire SwReporter folder. While it’s easy to delete the tool, it will be installed again whenever you update Google Chrome. For a more permanent solution, you will have to disable all users’ access to the process to completely block it from running. As we have mentioned above, deleting the executable file can only temporary removing it. When you update your Google Chrome, it will come right back to your system. So, a more viable and permanent solution would be to completely block software_reporter_tool.exe from ever running again. 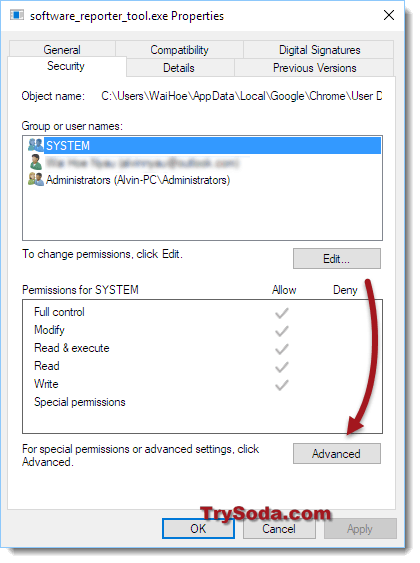 Here’s how to remove permission from all users so that this executable file can never be used again. Go to the said directory in step 1 above. Right click the folder named software_reporter_tool.exe. Select Properties. In the file properties, go to the Security tab. In the Advanced security settings window, click Disable Inheritance at the bottom. No one can use or make changes to this file ever again. Thus, when you update Google Chrome, software_reporter_tool.exe won’t be replaced and can’t be updated or opened again. Description for sharing: Google Chrome's Software Reporter Tool causes high CPU and Disk usage in Windows 10? 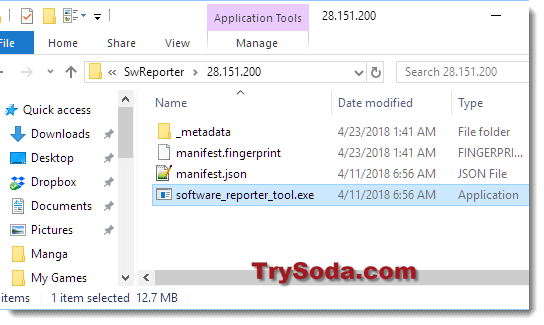 Here's how to get rid of software_reporter_tool.exe.